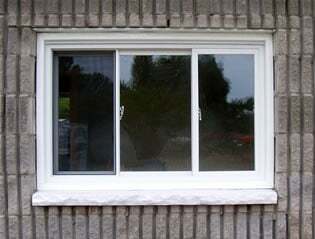 Our energy star windows are designed to be poured in place. The frame corners are factory welded with a plastic melting process for strength. These welded corners prevent concrete from entering the frame during pouring. The frames are wrapped in plastic with a sturdy wooden frame used to place the frames into the forms before pouring. Once the basement is poured the plastic wrap and wood frame can be removed. The glass is shipped separately to insure they don't break. We stock white frames but beige ones can be ordered. Standard Sizes available in 8" and 10"
30" x 16" 32" x 20" 36" x 24" 47" x 24" 56" x 24" 56" x 24" Egress 47" x 32" 47" x 32" Egress 56" x 32"
Each window comes with easy to understand installation instructions. It's as simple as measure, place, nail, and pour. Once the basement has been poured the glass can be put in place. 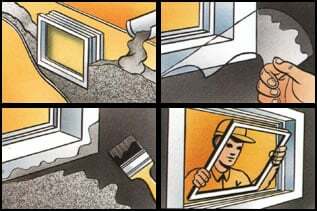 Most parts of the window can be replaced including the glass, screen, tracks and lock. Our egress windows meet and exceed minimum free opening and height requirements. The minimum free opening space must be 3.77 sq ft and must have a minimum height of 15". The 56" x 24 window is 17 7/8" tall and has a free opening space of 3.97 sq ft. The 47" x 32" window is 25 5/8" tall with a free opening space of 4.25 sq. ft.